Speed ramps are common place in today’s busy trafficked areas, often seen in car parks and entrance roads to areas where speed must be low to ensure concentration is focused on the surrounds rather than manoeuvring. Finished in yellow or black and fitted with white reflectors, the heavy duty ramps are manufactured using robust plastics. 420mm wide and 500mm long, the speed ramp modules and ends can be ordered to suit your requirement rather than in specific lengths or quantities. Their colour and reflectors allow the speed ramps to be easily seen during daylight and night which makes them ideal for busy 24hr warehouse operations where fatigue is not an excuse. Speed ramps and Zebra Crossing combined. Combining speed ramps with temporary safety walkways creates a unique product which clearly represents a safety place to cross vehicle routes and which drivers will easily see. The walkways are designed to be flexible and easy to install with speed ramps. Manufactured from durable plastics, the walkway sections are 1200mm long, x 600mm wide and stand 22mm high. 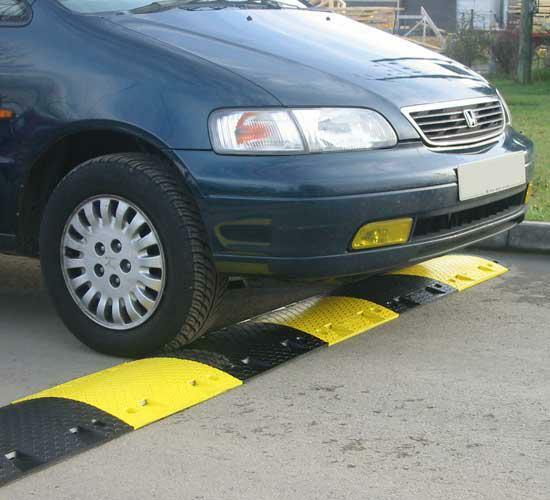 The speed ramps are finished in yellow or black and fitted with white reflectors, the heavy duty ramps are manufactured using robust plastics. 420mm wide and 500mm long, the speed ramp modules and ends can be ordered to suit your requirement rather than in specific lengths or quantities.